Spring days are generally warm and clear with the first rains falling towards the end of the season. The return of the migrant swallows and cuckoos signifies the onset of spring in the Garden. Together with a host of other bird species, they start to build their nests and prepare for the summer breeding season. One of the best known spring-flowering plants is the bush lily (Clivia miniata). These attractive shade-loving plants produce large heads of striking orange flowers. Yellow varieties are rare. Although they are well known all over the world, they occur naturally only in South Africa. In spring, the local wild flowers which start to emerge always intrigue visitors. A walk through the natural areas of the Garden in October and November is a real treat as numerous wild flowers come out in full bloom. The blood lily (Scadoxus puniceus) is one of the most striking bulbs with its magnificent head of red flowers. Summers are warm with temperatures often reaching above 30°C and occasional thunder showers in the late afternoons. The Garden is at its best during late spring and summer when most of the flowering shrubs come into bloom. The Pride-of-De-Kaap (Bauhinia galpinii) with its unusual brick-red flowers makes a lovely show. The mauve blue flowers of the wild phlox (Jamesbrittenia grandiflora) and Dissotis sp. are a delight for many weeks. One of the highlights of summer are the scarlet river lilies (Hesperantha coccinea)which line the stream near the restaurant and produce bright red flowers in mid-summer. The wild banana (Ensete vetricosum) with its giant leaves makes a magnificent show along the Water Garden. Arum lilies (Zantedeschia aethiopica) are also to be found in flower. Common sugar bushes (Protea caffra) are abundant on the north-east facing slopes of the Garden. 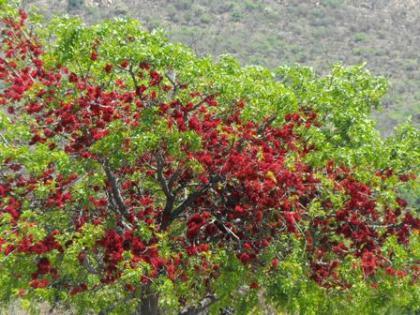 These naturally occurring trees produce attractive heads of flowers throughout the summer months and provide a constant source of nectar to a wide variety of birds. Cuckoos are an integral part of the Garden in summer and it seems as if there is no place to hide from their persistent calls. Listen out for the Red-chested Cuckoo, Diederik Cuckoo, Klaas’s Cuckoo and the Black Cuckoo from the beginning of October. The striking Southern Red Bishops start to build their nests in the bulrushes and reeds around the Sasol Dam and wetland areas. The male birds can often been seen trying to impress a future mate. In the ponds in the wetland area, look out for the large flowers of the indigenous water lily (Nymphaea nouchali var. caerulea) and the smaller star-shaped yellow flowers of the small yellow water lily (Nymphoides indica). Autumn days are mild and clear with evenings becoming cooler towards winter. This is an ideal time to visit the Garden when the tremendous variety of spurflowers (Plectranthus) burst into flower to herald the beginning of autumn. Many of these herbaceous shrubs and groundcovers make excellent garden subjects as they flower so profusely and have very attractive foliage. Garden Clivias (Clivia gardenii) start flowering in autumn near the Lion’s Bridge with their unusual pendulous flowers; unlike those of the usual bush lily, Clivia miniata. 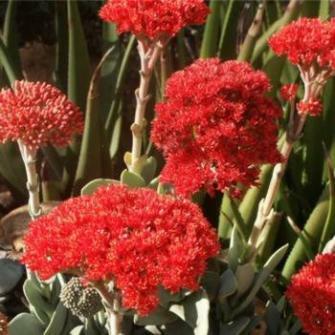 These lesser known clivias come from the east coast province of KwaZulu-Natal. The bright orange flowers of the Kalanchoe rotundifolia and the red flowers of Crassula alba and Crassula perfoliata var.minor in the Succulent Rockery Garden also create a lovely show at this time of year. By the end of autumn, many trees such as the white stinkwood (Celtis africana), river bushwillow (Combretum erythrophyllum) and the lavender tree (Heteropyxis natalensis) are all flowering in their respective yellows, reds and purples. 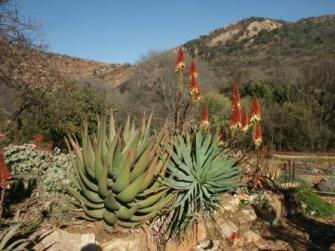 The Succulent Rockery is particularly beautiful during winter when most of the aloes are in full bloom. A variety of birds, including the magnificent Malachite Sunbird, feed on the nectar from showy plants such as Aloe cryptopoda which has attractive bi-coloured flowers. The pair of Verreaux’s Eagles (Black Eagles) that are resident in the Garden raise their young at this time of the year and you may be fortunate enough to see them with their newly hatched chicks. On the rocks at the waterfall the krantz aloes (Aloe arborescens) start to flower with their striking heads of red and yellow flowers. Walk through the Garden and appreciate the pale stems of the white stinkwoods (Celtis africana) and river bushwillows (Combretum erythrophyllum), which have an eerie, almost skeletal appearance. 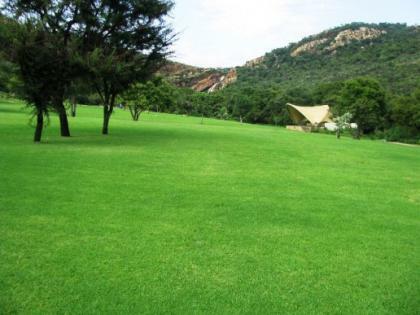 Winters on the Highveld are mild with sunny blue skies during the day and occasional frost in the mornings. Picnic concerts featuring a variety of performers are held in the Garden on alternate Sundays from May – September. At the end of winter, the common wild pear (Dombeya rotundifolia) can be seen from afar by its axillary clusters of white to pale pink flowers. The sagewood (Buddleja salviifolia) promises the onset of spring and bursts into flower, filling the air with its fragrant scent.